The Tour du Mont Blanc is one of the most popular long-distance walks in the world. It circumnavigates the Mont Blanc massif, crossing a distance of about 165 km (103 miles) with a total ascent and descent of 10,000m. The trail crosses through France, Switzerland and Italy. The starting point of our tour is Les Houches in the Chamonix valley. We trek in a clock-wise direction along well-maintained trails to small villages where we spend the night. The views are outstanding throughout: huge granite spires, tumbling glaciers, snowy peaks and fast-flowing rivers. 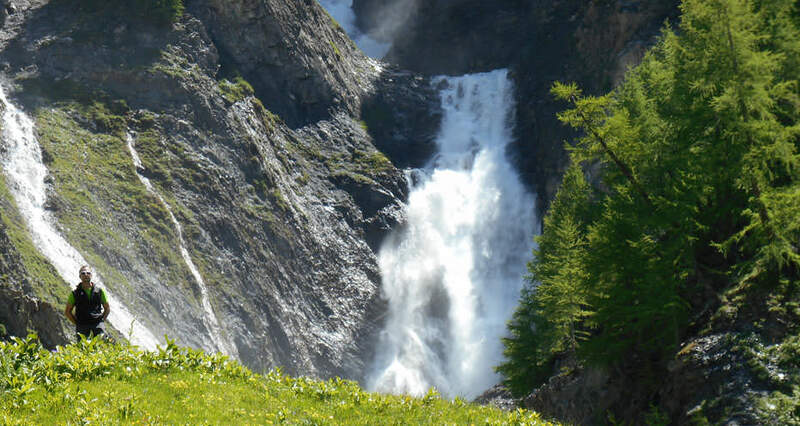 You will see magnificent Alpine flowers, birds of prey and animals such as ibex, chamois, stoats and marmots. Situated at the foot of Mont Blanc, Les Houches is a great starting point for the Tour du Mont Blanc. Les Houches is a small town 7km from Chamonix and has a few restaurants, bars and outdoor equipment shops. If you want to visit Chamonix town, it takes 15 minutes by public bus. Argentiere is a pretty village with flower-filled window boxes, local shops and a few hotels. There is an old and new section to the village. In winter it is full of loud skiers; in the summer it is much quieter. Located just over the French border in Switzerland the Col du Forclaz is a cluster of quaint buildings along a road. You can hear cow bells and enjoy views of the Trient glacier..
Trient is just 45 minute hike before La Forclaz, but offers a great alternative if the hotel at Col du Forclaz is full. There are two auberges and a bar. Following the Bovine Route from Col du Forclaz will bring you to the lakeside village of Champex. The route winds through thick forest to a high shepherds’ alpage at Bovine and then on to Champex Lax, deep in the Swiss Alps. Champex offers a range of restaurants, bars, and hotels with views of the Grand Combin. This village along the Tour du Mont Blanc has beautiful alpine scenery, a raging river and great views of Mont Dolent. There are a handful of hotels, a small supermarket and an aerial ropes course in the trees. Close to Courmayeur is La Palud in Italy. It is a few minutes walk to the Skyway Monte Bianco, a cable that takes you to Pointe Helbronner. The spa at Pre St Didier and lots of gentler walking options are close by. Aosta is one hour by bus and has Roman walls, an amphitheatre and medieval walls and buildings. From Courmayeur, through Ville-des-Glaciers, descend into Chapieux and back into France. Les Chapieux is located on a remote part of the Tour du Mont Blanc, it is a small hamlet surrounded by steep hills. There are wonderful mountain views, white-water streams and a multitude of wild flowers. An old Roman road runs through Croix du Col du Bonhomme and on to the pretty French village of Les Contamines. There are old farm buildings – many have been restored to traditional Savoy architecture. There is the Church of Notre-Dame de la Gorge which is just off the Tour du Mont Blanc. Heading out of Les Contamines you will pass through pretty forests and meadows to the Chalets du Truc perched under the great west-face of the Mont Blanc massif. There is a small peak you can climb before descending to the Chalets de Miage at 1559m. You then make a steep climb to the Col du Tricot (2120m) and then on towards the plateau above Les Houches. This is a fitting end to your trek with the most outstanding views of the Chamonix Valley, the Chamonix Aiguilles and the Mont Blanc massif. To find out more contact us via our online form.